Quartz is an attractive, expensive stone used in many homes, both modern and traditional. Quartz can be a pricey addition to kitchens and bathrooms, but it may be well worth the investment because it is easy to clean and maintain. By using the proper cleaning products and avoiding materials that will harm the quartz surface, you can keep your sinks looking fresh for many years. Clean quartz sinks with mild cleaners. Fill the sink with an inch of water and a squirt of liquid dish soap. Dip a cleaning cloth into the soapy water and wipe it over the entire sink. This will remove all day-to-day grime. Rinse the sink with fresh water. Dry it with a dish towel. Remove ink-based and similar stains by soaking the edge of a cleaning rag in denatured alcohol and rubbing it over the stain until the stain is gone. 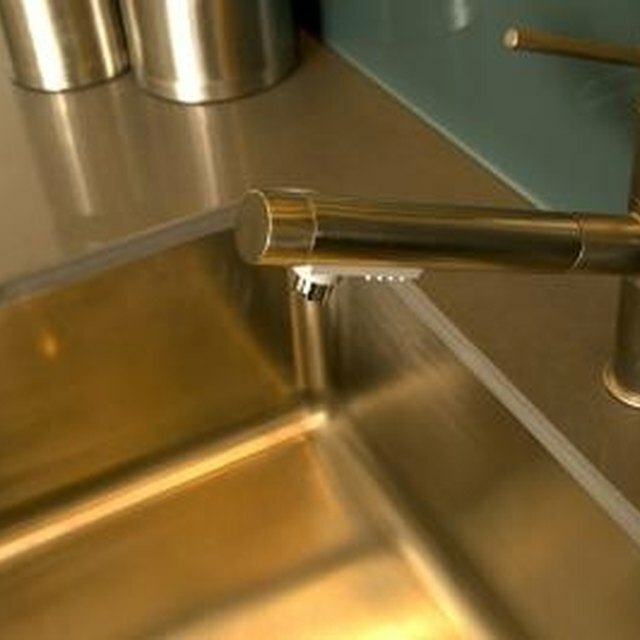 Rinse the sink to wash away the lifted stain residue and the alcohol. Clear away heavy residue with oxygen bleach. Fill the entire sink with water, and pour in 2 tbsp. oxygen bleach per gallon of water. Let the mixture stand overnight. Drain the sink the following morning, wipe the sink with a cleaning cloth and rinse the sink with clear water.